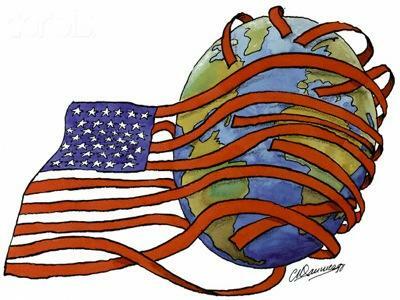 Which is the more remarkable — that the United States can openly announce to the world its determination to invade a sovereign nation and overthrow its government in the absence of any attack or threat of attack from the intended target? Or that for an entire year the world has been striving to figure out what the superpower’s real intentions are? Idealism: remaking the world in what the true believers see as America’s image, with free enterprise and Judeo-Christianity as core elements; here is Michael Ledeen, former Reagan official, now at the American Enterprise Institute (one of the leading drum-beaters for attacking Iraq): “If we just let our own vision of the world go forth, and we embrace it entirely, and we don’t try to be clever and piece together clever diplomatic solutions to this thing, but just wage a total war against these tyrants, I think we will do very well, and our children will sing great songs about us years from now.” Oil: the sine qua non of Middle East policy, yesterday, today and tomorrow; to be in full control of Iraq’s vast reserves, with Saudi oil and Iranian oil waiting defenselessly next door; OPEC will be stripped of its independence from Washington and will no longer think about replacing the dollar with the Euro as its official currency; oil-dependent Europe may think twice next time about being so uppity. Arms industry: As with each of America’s endless wars, military manufacturers will rake in their exorbitant profits, then deliver their generous political contributions, inspiring Washington leaders to yet further warfare, each war also being the opportunity to test new weapons. Israel: The men driving Bush to war include long-time militant supporters of Israel, such as Richard Perle, Paul Wolfowitz, and Douglas Feith, who, along with the rest of the powerful Israeli lobby, have advocated smashing Iraq for years. Israel has been playing a key role in the American military buildup to the war. Besides getting rid of its arch enemy, Israel could use the opportunity to carry out its final solution to the Palestinian question — transferring them to Jordan, (liberated) Iraq, and anywhere else that expanded US hegemony in the Middle East will allow. Iraq’s abundant water could be diverted to relieve a parched Israel.